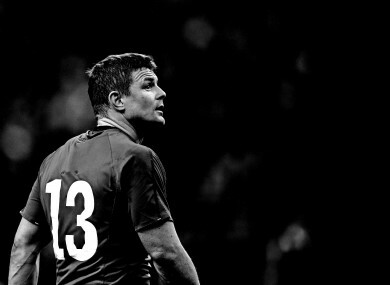 BOD’s farewell reigned supreme in the ratings. Viewers couldn't get enough of O'Driscoll in 2014. NO MATTER HOW big a global event is, we would still rather tune into something with an Irish angle. Despite the World Cup final this past July arguably being the biggest global sporting occasion in 2014, it was only the second most watched contest on Irish television last year. Brian O’Driscoll’s fairytale finish in Paris with the Irish team came first, attracting 891,000 viewers to RTE and getting an audience share of 60.1%, so three out of every five viewers in the country watched Ireland win the 6 Nations. The World Cup final between Germany and Argentina came second with 859,000 viewers. Third and fourth were occupied by the All-Ireland finals and although many raved about the hurling decider and trashed the football equivalent, the big ball got more viewers with 831,000 to 796,000. The top 5 was rounded out with Ireland’s narrow 6 Nations defeat against England at Twickenham, which 717,000 tuned into. Here is the complete top 20. What sporting event did you enjoy the most? Email “2014 was a big year for sport, and here were the most watched events on Irish television ”. Feedback on “2014 was a big year for sport, and here were the most watched events on Irish television ”.